Another Scrapbook wallpaper. Honestly, I never get tired of this style because of my actual scrapbook at home. This is how my table usually looks like when I'm sticking pictures, making designs and so fort. My table is a mess when I make my scrapbook. I just wanted to portray that in a wallpaper. 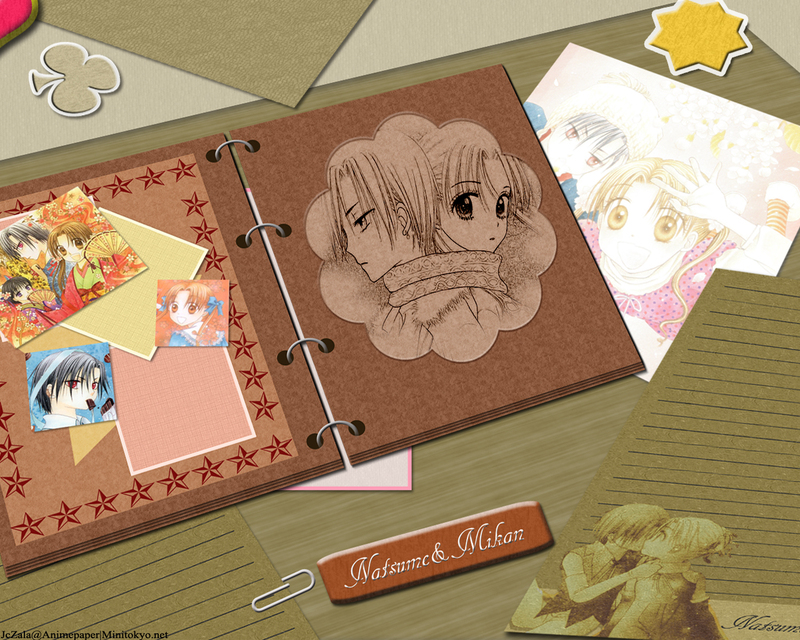 This wallpaper features Natsume and Mikan, my most favorite couple in Gakuen Alice. Done an excellent job on it. It's very creative. Love the realistic work here. The scans go well all together and the designs are just awesome. You're really something when creating wallpapers. This couple rocks too. But I'm just happy to see Mikan-chan here!